The Miami Marlins shocked the sports world when they gave Giancarlo Stanton a 13-year, $US325 million contract, the largest in the history of North American sports. On the surface, the deal seems crazy because the Marlins have terrible attendance, one of the worst television contracts in baseball, and Stanton is still a relative unknown in the sports world. But like many things in sports these days, huge contracts often have less to do with baseball production, and if we look deeper, the deal actually makes perfect sense for the Marlins. 1. 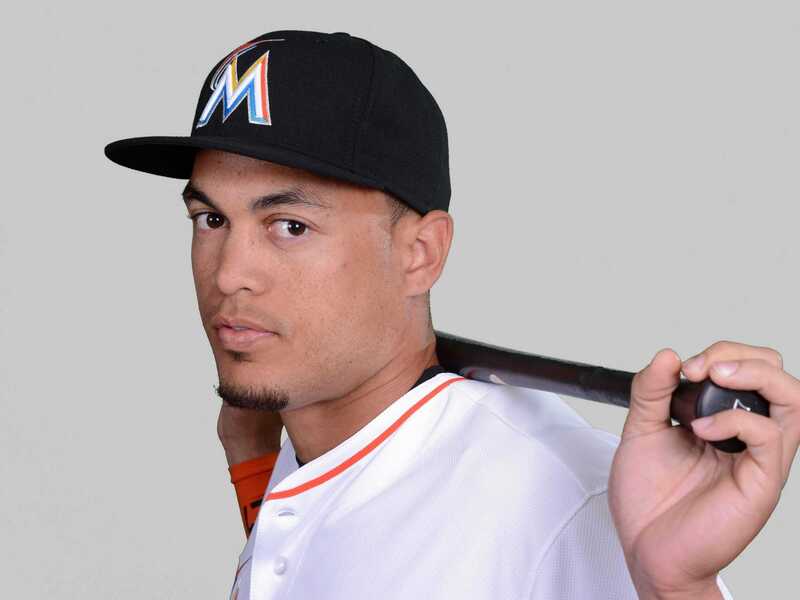 The Marlins are banking on Stanton becoming a superstar. 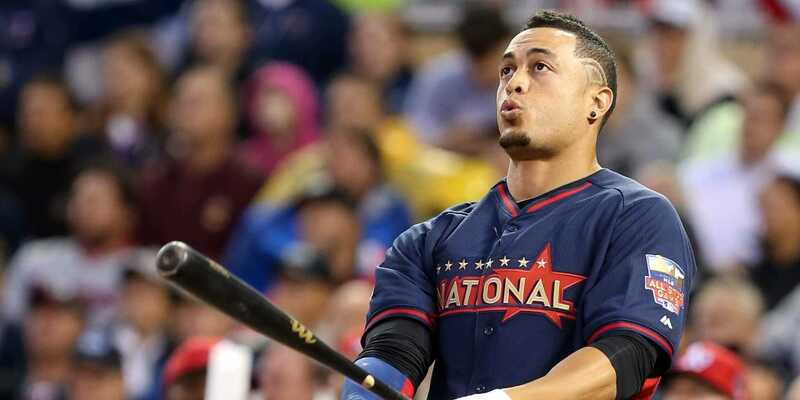 Quite simply, Stanton will be 26 next year and is already one of the five best players in Major League Baseball and he has the tools that suggest he will continue to be one of the top players for years to come. This is not a situation like the Angels giving a 32-year-old Albert Pujols a 10-year, $US240 million contract on the downside of his career or even like the Phillies giving an ageing slugger like Ryan Howard a 5-year, $US125 million contract. But beyond baseball, Stanton has the makings of becoming MLB’s next great superstar. He is young, talented, good looking, and has one of those infectious personalities that translates well to television and superstardom. And while we may have referred to Stanton as “baseball’s best-kept secret” in the past, this contract ensures that Stanton is no longer an unknown commodity and is now very much on the national radar. 2. Stanton’s contract is an investment in the Marlins’ future TV revenue. The team needed to show the fans that they were committed to keeping players on the verge of greatness in Miami, something the team has rarely done in the past. This is important to help boost attendance at the new Marlins Park where the team averaged just 21,000 fans in 2014, 27th in MLB, in the stadium’s third season. 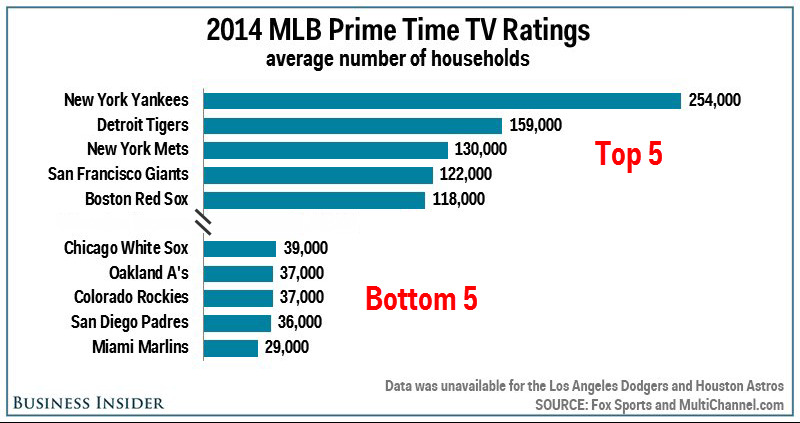 But more importantly, the Marlins needed to do something to boost television ratings and they needed to do it now. 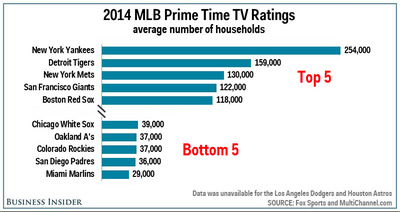 Of the 27 MLB teams in the US with games available on TV throughout their local market, the Marlins ranked dead last with an average of just 29,000 households per game in 2014. As a result of the poor ratings, the Marlins have what is believed to be the worst local television contract in baseball, worth just $US13-18 million annually. To put that in perspective, the Dodgers new deal is worth $US334 million per year and the Mariners recently signed a new deal with an average annual value of $US118 million. But here is where Stanton’s deal make sense for the future even if it makes little sense right now. The Marlins TV deal expires in 2020. However, according to owner Jeffrey Loria, negotiations on the next deal will begin soon. This suggests that negotiations will begin sometime next year or early 2016 and it may even indicate that the Marlins have an out-clause in the deal. 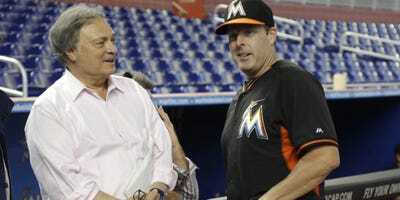 APJeffrey Loria (left) is banking on a future boost in TV revenue. In other words, a huge TV revenue boost is coming for the Marlins in the next few years and Stanton’s contract makes the TV contract even more valuable as the Marlins can now guarantee that they will have a legit superstar on the team for a large portion of that next deal. On top of that, Loria is already promising to surround Stanton with “All-Star calibre players” and we have seen with the Miami Heat that the local fans will support a contender with a top player surrounded by All-Stars. In the end, whatever the Marlins are overpaying for Stanton’s baseball production, they will more than make up for in television revenue and in 2014 television revenue is king.